It’s been days since the final session at the HSMAI Digital Marketing Strategy Conference and I still can’t believe I was in NYC. Yes, it was my first time in the big city and no, I didn’t let my short time there go to waste. 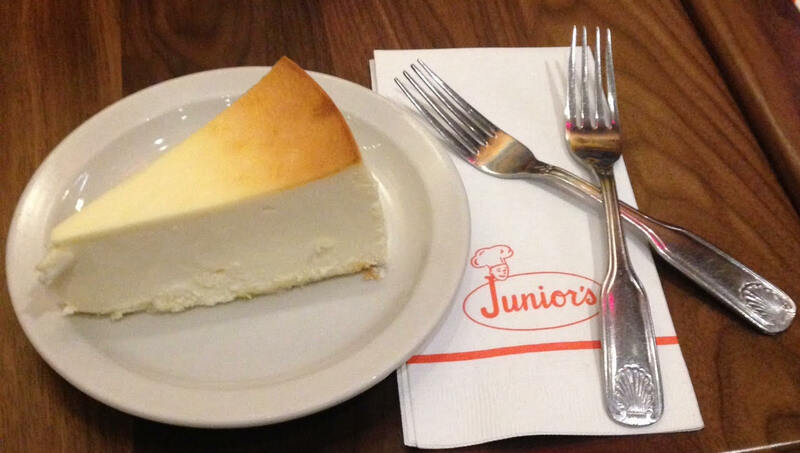 From a chilled glass of Riesling away from the Times Square noise at Wine Escape to a slice (or three) of possibly the world’s best cheesecake at Junior’s, I’d say I wined and dined pretty well during my quick stay. But that’s not what brought me to New York City. I recently attended HSMAI’s annual digital marketing conference with some colleagues. And I have a lot to say about my first experience. For my readers that don’t know, HSMAI stands for Hospitality Sales Marketing Association International. And because I joined Red Roof’s marketing team last fall, I wanted to get in-depth advice from the hospitality experts of the digital marketing scene. I quickly learned that the conference attendees were not #TeamFollowBack like I am, at least when it comes to using the Twitter hashtag #HSMAIDigital. And I was humbled when @HSMAI retweeted me. To top it off, I ate my feelings at the best lunch spread I’ve ever had at a conference (most of the food was vegetarian!). Scott Brinker talked about how quickly software is enhancing the way we use marketing in our industry. And he didn’t lack the stats to back up his claim. In just seven years, marketing technology has skyrocketed from a mere hundred to thousands. 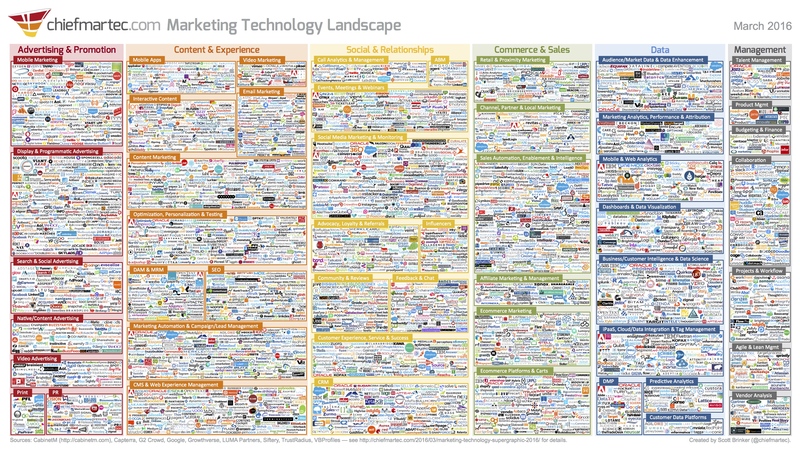 That’s right: As of 2016, there are 3,874 marketing technology solutions. And we’re still waiting on the 2017 final count, so you can bet there’s even more. This shouldn’t have surprised me. I once worked for a CRM company and knew that we had hundreds of competitors just in that industry, even with a finely-crafted target audience. But it’s easy to forget just how expansive the technology software is when we tend to only compare a handful of options when deciding which marketing software to use. We usually don’t look past the first page of an Internet search when we’re shopping around for the next marketing tool. What surprised me more about this number was actually the variety of marketing technology solutions. Just scroll back up to the graphic and find subcategories under each category. Now that marketers are so in-tune with the digital user experience of our target audiences, it takes a lot of marketing tools to personally enhance their experience with us from start to finish. That means a lot of tools to play with for us marketers. While I strongly disagree with his claim that Trello and Slack are agile marketing tools (they’re just not, unless you download the Scrum for Trello extension), I look forward to reading my copy of Brinker’s book Hacking Marketing. During the View from the Top panel, Dr. Lalia Rach asked those hospitality leaders of this session where they started in the hospitality industry. I expected to hear titles with “specialist” or “manager” or “consultant” tagged at the end. Those weren’t the answers they gave. One worked the front desk. Another was a busser. And someone was even a garbage collector. I should’ve known better. My own start in hospitality wasn’t in marketing but as a restaurant hostess and prep chef. At one point, I worked 60 hours a week to save up for a college degree. That’s not why it should’ve been obvious to me. Just look at those who serve in hospitality. They put in the hours and the effort not just to elevate their status in the industry, but more so to provide the best experience for their guests. Titles are earned, not bestowed. And that’s refreshing to learn after my past experiences in other industries where the only way to move up is by brown-nosing (which really isn’t my style). That’s simply not how hospitality works. The guest is king (so to speak), and you have to fully understand how to provide that excellent experience in order to lead a company in the service industry. That means learning from years of experience at the corporate office and on location. Thanks for the inspiration, panel leaders. I was confused when I swung by the dessert table and picked up a cupcake with a “90 Years” mini-sign crowned on top of its purple frosting. “Who turned 90?” I asked. I was stuck on the fact that I was at a digital marketing conference. Nevermind that the hospitality industry has been selling and marketing to guests in (what my generation now calls) the old school way. But it’s true. In 1927, hotel executives from around the world gathered in Chicago for the first International Conference on Hotel Business Promotion (on September 24, to be exact). Since then, the organization now known as HSMAI has grown across the planet with the goal of elevating the profession as well as advance the skills of its members within the industry. I can eat a cupcake to that! Did you attend the HSMAI Digital Marketing Strategy Conference? What were your key takeaways from your experience this year? Share your story in the comments section below.